The Porto collection is a collection of wedding dresses made of soft and elastic lace. These are extraordinary light wedding dresses. See and fall in love with one of them! Before one of the most beautiful days in her life, the future bride starts looking for a dream wedding dress. First, she browses through hundreds of websites and creates countless catalogues with photos, and then, with a wedding inspiration book in her hand, she visits several or more wedding dresses salons. There are many different proposals waiting for her: short and long wedding dresses with tulle and lace. Although the salons gather the most beautiful wedding dresses from colorful magazines, we all know how difficult it is to find the perfect outfit. Searching for this dream one takes a lot of time and rarely ends in success. When we finally find the perfect dress, it turns out that it completely does not meet our expectations. We like wedding dresses with lace, but the chosen model is made of a different material. We would rather add something or take it with us and suddenly we start to get lost in all this. Solving our problems is also hindered by the lack of competent consultant advice in the salons and the extremely different opinions of people we take with us as advisors. Eventually, the process of searching for a dream creation ends with stress and feeling that we will not find the only one for the next years. In order to show you that the perfect wedding dress does not only exist in urban legends and to make its purchase a real pleasure, I have created a collection of wedding dresses. The Porto Collection is not just a collection you know from other salons. I designed it in a very thoughtful way, so that all models of wedding dresses can be easily combined with each other and created from them original combinations. This is how a dozen or so types of tops, many variants of skirts and a lot of accessories that add expression to the styling. You have a huge number of options to choose from. 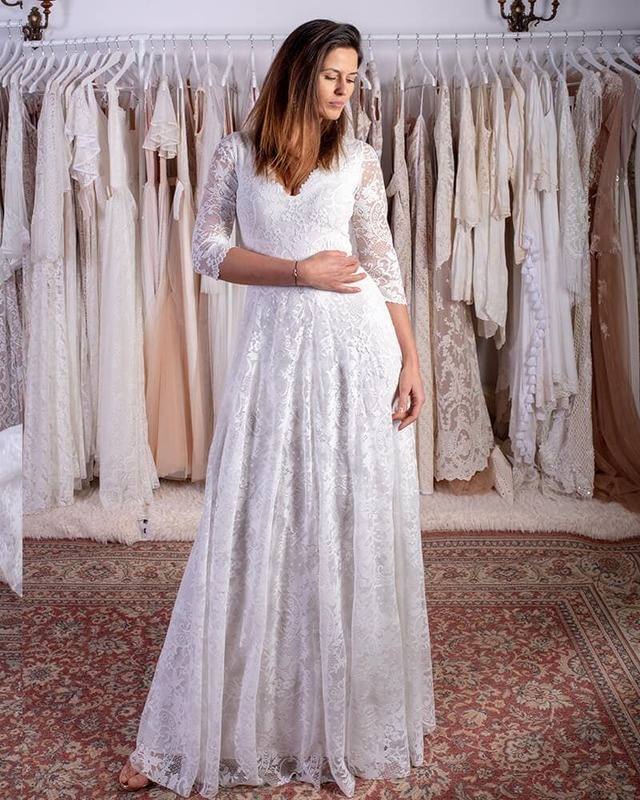 A simple wedding dress from the catalogue can in a moment turn into a jewelry creation, if you choose a richly decorated, multi-layered skirt to the gentle top. Thanks to this innovative solution I can offer you short wedding dresses and those reaching all the way to the ground and each of them can be classic or wild. There are many possibilities, right? You will decide whether your creation for this Great Day will be a modest wedding dress, made of delicate lace and chiffon, or a multilayer dress made of different types of materials. You can freely combine individual elements. I give you this option, because I believe that this is how the most beautiful wedding dresses are made. Although Porto is a ready-made collection, each model will be tailored to your needs in a very short time! In salons you usually wait even half a year for your creation. My projects are created in just one day! During this day I am available only for you and we sew your wedding dress together. However, before you visit my studio, remember to make an appointment with me in advance. It happens that in unusual situations I save my clients a few days or even a day before the wedding, but usually my calendar is full. I want the whole process to be a nice adventure for you and I really want you to be sure that you can get your dress right away. No stress, endless waiting and constant visits to make further improvements. In my studio, while reviewing the most beautiful wedding dresses from the Collection, you will be able to choose the cut, pattern, color and style that you dreamed of. Then let’s choose the combination that will suit you and emphasize your feminine beauty. I have many years of experience in design and styling, and all my knowledge serves you while creating your wedding dress together. Once we have established the cut in which you feel great and all the modifications, your creation will be made the same day. It’s not a joke or a cheap marketing trick! There will be no need for changes or corrections, because it will be matched exactly to your dimensions. On the same day that you cross the threshold of my studio, you will receive your dream wedding dress. Are you ready for it? Wedding dresses, visible in the catalogue below are examples of combinations of elements available in my offer. I want you to be able to see for yourself how the different details work together, so I have created combinations of tops, skirts and belts that can be combined in any way you like. Description of each wedding dress includes the price. This is the value of composition shown in photo, thus if you think about making changes to the model, treat it as a guide. The final amount depends on the extent of interference in the cut, type and quantity of materials used.